Believers in Christ (mostly women) encounter the following passage in times of burnout. We’re told that we need to learn to sit before the Lord like Mary and not busy ourselves like Martha. As we live in society, we come to identify various blessings and responsibilities as our portion. As a woman and a home owner, Martha came to accept her portion as “host.” Having the Messiah and his inner circle eat at her home was a tremendous opportunity, but also a burden. Her enjoyment of this portion would depend on how well she performed in this role. If her guests were well served, then she could delight in her contribution to Jesus’ mission and enjoyment. If she fumbled or failed under the burden of serving, then her portion would become spoiled. Everything would depend on the outcome and the outcome depended on her. With so much at stake, no wonder she came to resent Mary and further still to criticise Jesus. I don’t think that was the answer he was expecting. Had someone asked him that question he would have responded with something like, “I want God to use me to care for ‘the least of these'” or something like that. I say that because he was visibly taken aback by my response. Maybe it was more self centered and less purpose oriented than he had heard, but he rolled with it even offering my desire up to God in prayer on my behalf. Doing well was my portion. Caring for others was his. Which of us sought the good portion? Neither. The good portion cannot be taken away. In my case, in order to do well, I needed the help of other people much like Martha did. My portion would always reside to some degree under the control of other people who might not want to cooperate. And yet his portion resided in the hands of other people as well. Even if he narrowed his purpose to only the good things he could do for others, people might oppose his attempts to serve. Circumstances could conspire against him to draw his attention and energy away from helping others. If nothing else, old age will eventually render him unable to care for others and require instead that he accept care. I’m not saying that we shouldn’t want to do well or care for others. I don’t believe that the monastic life or contemplative practice is better than a life on mission. What I am saying is that the outcome of our efforts can never become our portion – i.e. the thing we want out of life. I’m saying that if we make fellowship with Jesus our portion that all of the other things will get done without our becoming resentful of others or disappointed with God. Had Jesus been up serving, Mary would have joined him. Fellowship with him was her desire and it was his method. Fellowship with Christ is the one necessary thing among an innumerable multitude of urgent needs. Through a pursuit of fellowship with Christ, disciples become like him and through him any and everything that actually matters gets done. 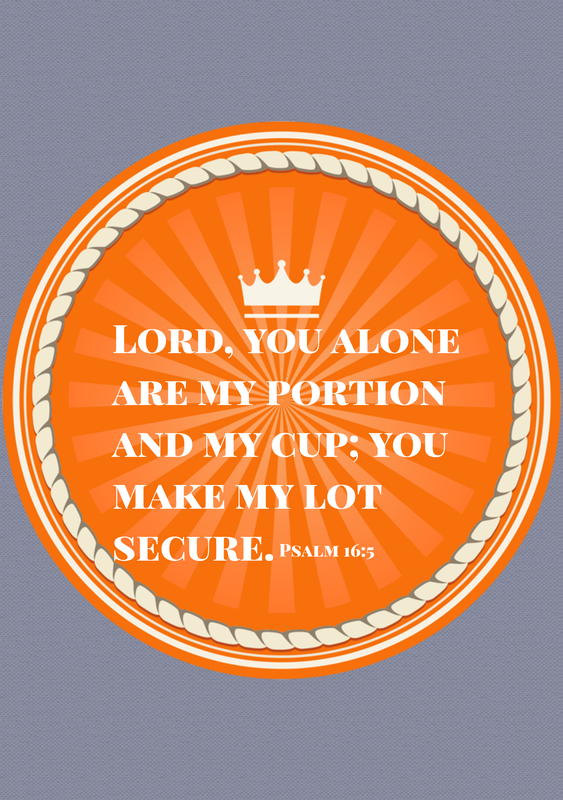 Christ is the portion which can always be enjoyed and never taken away. Since he became one of us and took on all of our experience, we simply need to attend to his presence within our experience to have fellowship with him. He’s here in this moment. What is he teaching us? He is in the Scripture. He meets us in lowly service. We taste of his life in poverty or persecution. In helplessness he is there. In death we meet him in sweet fellowship. On the other side of death we find full enjoyment of the very purpose of our earthly life. Whatever we may miss out on in life, whatever failures we experience, they cannot threaten our joy and peace because Christ missed out and Christ suffered apparent failure and so finds us in those experiences and offers himself as our portion. We never need to resent another person. We needn’t ever succumb to frustration or stress or fear because our Lord is with us, he’s all we need, and he will never leave us.